Gum disease may increase your risk of all kinds of other health complications, including diabetes, stroke, and heart disease. It has even been linked with problems in pregnancy and dementia. All the more reason to take good care of those pearly whites! What to give the person who has everything? How about a voucher for a Thai or Remedial Massage? £50 for a one hour massage, or £30 for 30 minutes, it’s the perfect pre-Christmas treat. Pop in to clinic to purchase your voucher. The health watchdog NICE (National Institute for Health and Care Excellence) is to recommend that vaginal mesh operations should be banned from treating organ prolapse in England. The documents are currently undergoing consultation prior to publication, and in them NICE said there were “serious but well-recognised safety concerns” and that “evidence of long-term efficacy [for implants treating organ prolapse] is inadequate in quality and quantity”. Hypopressives is a specific form of training which targets the core and pelvic floor, providing a non-invasive method of treating pelvic organ prolapse. 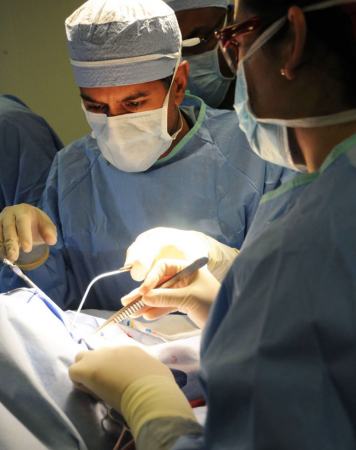 Hypopressives training can negate the need for invasive surgery such as vaginal mesh operations, which are increasingly shown to be unnecessary and ineffective. For more information on hypopressives training, please click here. Back pain during pregnancy- it might be common, but it isn’t normal! With top tips on how to avoid back pain during pregnancy, along with information and advice on the causes of lower back pain and how chiropractic can help, this resource is a must-read for all expectant mums! In this resource, we also discuss the other considerations for expectant mums, including nutritional advice, exercises, and other factors that could affect your pregnancy. Download it here. Did you know… A growing body of research shows that drugs such as paracetamol, ibuprofen, gabapentin and diclofenac are largely ineffective for back pain. Opioids (such as oral hydromorphone, oxymorphone, morphine, tramadol, tramdaol with paracetamol, tapentadol, oxycodone, fentanyl and hydrocodone) have also been found to be largely ineffective with high risk of side effects including dependence. Research recommends manual therapy, exercise, and cognitive behavioural interventions… all of which can be provided by a chiropractor! What sort of training do Doctors of Chiropractic have? A chiropractic degree is a four year full-time course, the first two years of which covers topics that are almost identical to those covered in a medical degree, and range from basic sciences such as embryology, physiology and biochemistry, to clinical sciences such as pharmacology and radiology. The key difference between chiropractic and medicine degree programmes is the weighting of the subjects. 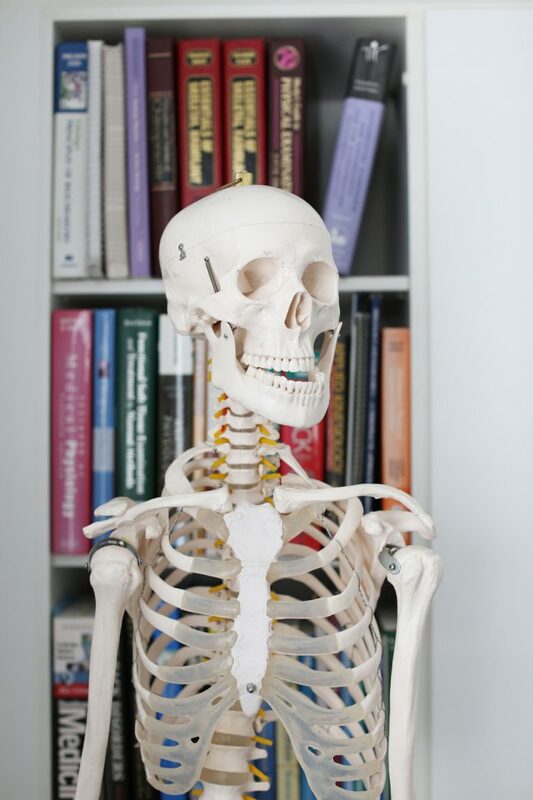 For example, chiropractic students spend a far greater amount of time on anatomy than medical students, but do not study pharmacology in as much detail as chiropractors opted not to have prescription rights. A huge focus of training is on practical and clinical work, covering orthopaedic and neurological examination, general diagnosis, clinical nutrition, anatomy and physiology, behavioural sciences, psychology and mental health, clinical imaging, joint biomechanics, functional management, paediatrics, obstetrics, geriatrics and pathology. 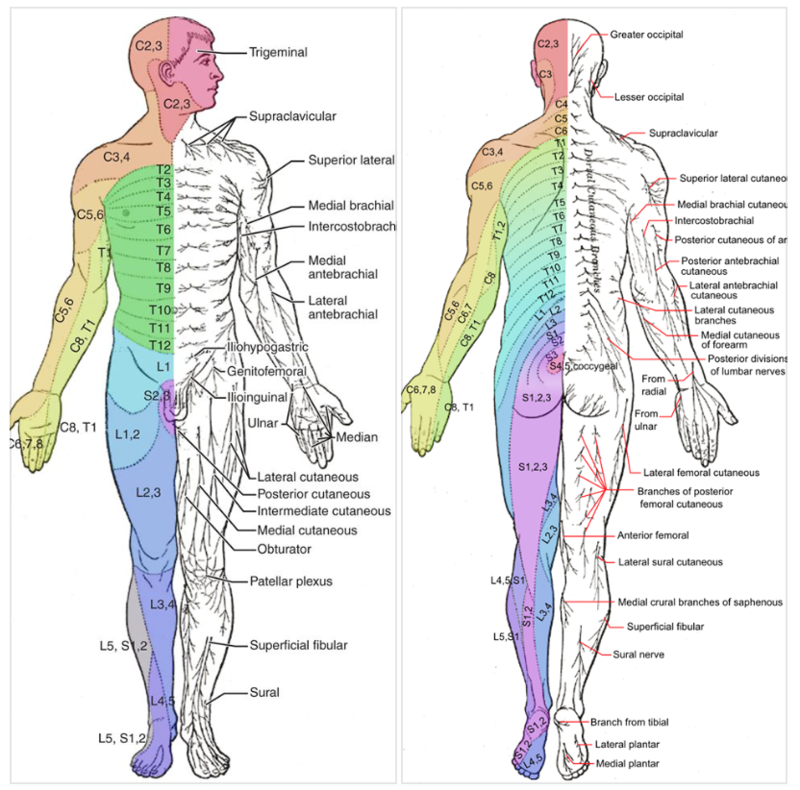 As part of their training, chiropractors also engage in prosection and study of cadavers to truly appreciate the structure of human tissues and the anatomy of the body. In addition, our training focuses heavily on perfecting the manual techniques used in practice. Practical classes begin with learning to assess joints, muscles and nerves, introducing methods of treatment alongside. These classes build from a very basic level to the most advanced manual techniques in current medicine. Finally, after years of academic and practical development, chiropractic students enter into a clinical year. This year is based in a specially designed teaching clinic. Students are supervised throughout this process, and by the end of the year have delivered over three hundred treatments and consultations each. But it’s not over yet…. After completing their clinical year and graduating, chiropractors then must complete a year of supervised practice before becoming fully-fledged Doctors of Chiropractic!! Did you know… why Brad Pitt has such a defined jaw? It’s probably due to overdevelopment or hypertrophy of the masseter muscle. The masseter is located in your jaw, and based on its size, it’s actually the strongest muscle in the human body. With all muscles of the jaw working together it can close the teeth with a force as great as 55 pounds (25 kilograms) on the incisors or 200 pounds (90.7 kilograms) on the molars. Think of that as you’re tucking in to your Sunday lunch! After a thorough assessment, we diagnosed him with sacroiliac joint dysfunction, a complex issue which is common in footballers, complicated further by an old quadricep muscle tear in his right thigh causing some issues! We’ve treated him five times with a combination of joint adjustments, soft tissue work, kinesiology taping and rehab exercises. 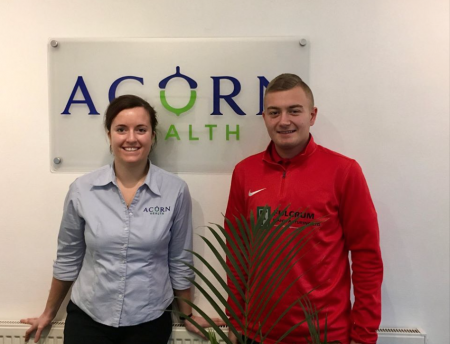 Here he is with Philippa today having popped in for his final appointment- We’re delighted he’s pain free and back on the pitch playing for Widbrook FC. 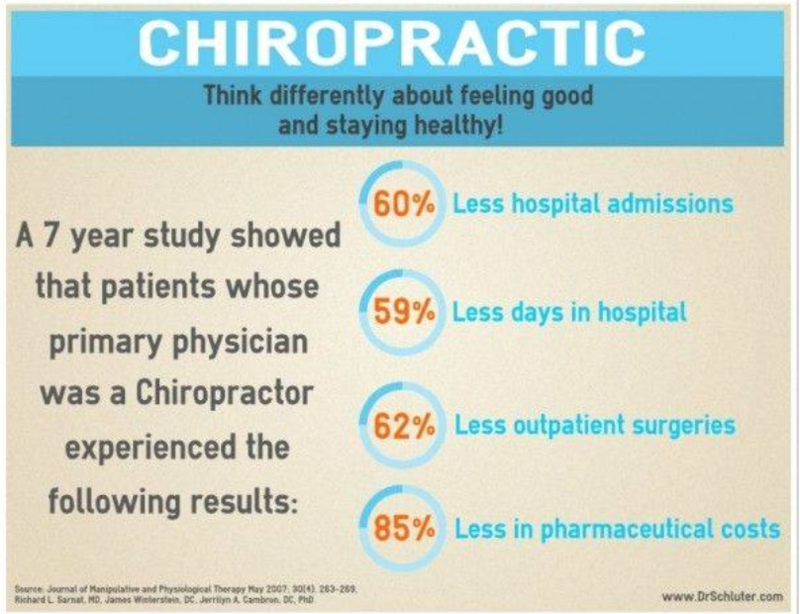 Chiropractic- it’s not just for back pain! Your brain cannot feel pain. r toe or touch a hot stove, your body releases chemicals that trigger signals to go up to the brain, telling the brain about the pressure from the stubbed toe, or the heat from the hot stove. Your brain then interprets that information and decides what to do with it- generally, it’ll tell you it’s painful so you stop touching the stove or rub your toe better! Although the brain interprets these pain signals, the brain itself does not feel pain, only the structures around it can do that! As a matter of fact, once inside the brain, surgeons can operate on the brain without anaesthesia. In one technique known as brain mapping, surgeons probe brain tissue while monitoring reactions like muscle movement and speech — all while the patient is awake! 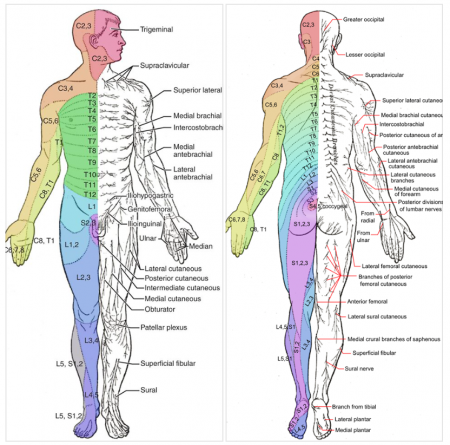 A dermatome is an area of skin supplied by a single spinal nerve. By testing the dermatomes in conjunction with a range of other neurological and orthopaedic tests, your chiropractor can identify not only where a problem might be in your spinal cord, but also what type of problem it is! The homunculus is a model that shows how your brain sees your body. 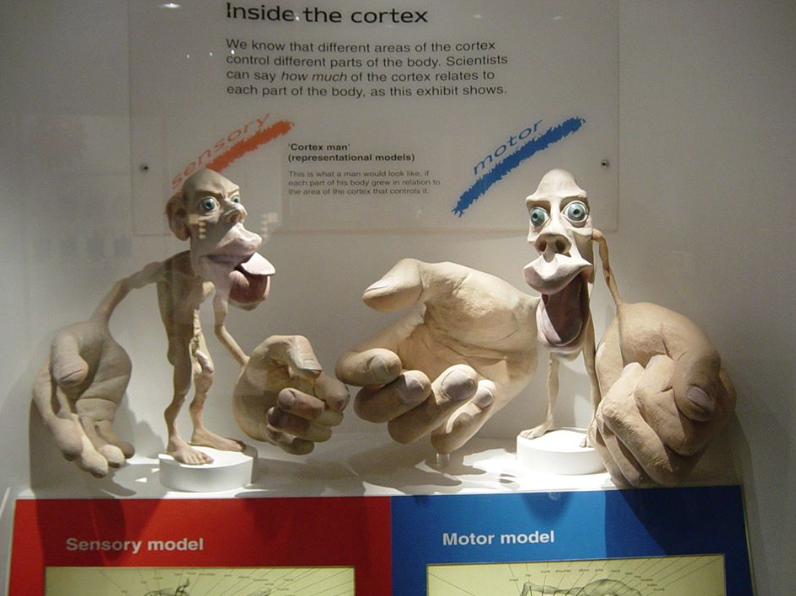 The cortical homunculus represents the importance of various parts of your body as seen by your brain. Most of us have very sensitive hands and lips, hence why these areas appear larger on the homunculus. Did you know these “mental maps” can change with experience. People who read Braille (which is done with an index finger) develop large areas that respond to stimulation from the index finger. A homunculus mapped on the motor cortex of a Braille reader would have an absolutely enormous index finger! 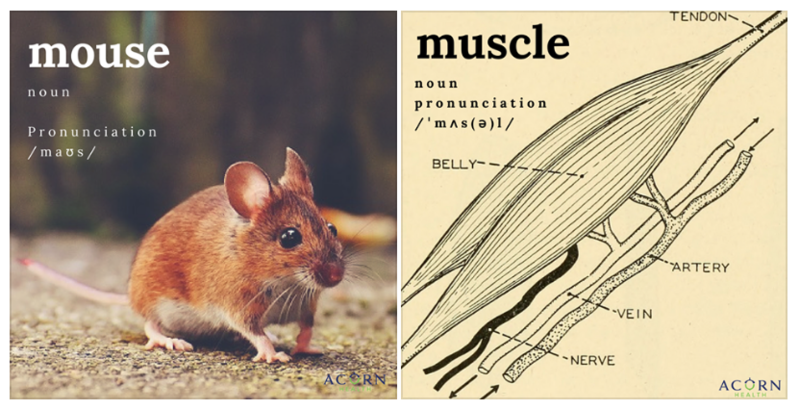 The word “muscle” comes from the Latin for “little mouse”, musculus (the diminuitive of mus). There are two theories behind a mouse becoming a muscle- firstly, that the Romans thought the movement of a contracting muscle resembled a mouse moving under a rug. Or secondly, that in a rather abstract way, a muscle looks a little like a mouse- with a round body (muscle belly) ending in a long thin tail (the tendon). Did you know… Kinesiology tape is just one of the many adjuncts that might be used during your chiropractic treatment. You can purchase Sporttape from us in clinic- find out how it works and why we use kinesiology tape for pain and problems. Read more here. Did you know… Our acupuncturist Gillian is a former midwife and has specialist knowledge in helping couples undergoing fertility treatment. – Increasing blood flow to the ovaries and uterus and helping to relax your muscles which can improve the chance of an embryo implanting. Did you know…. 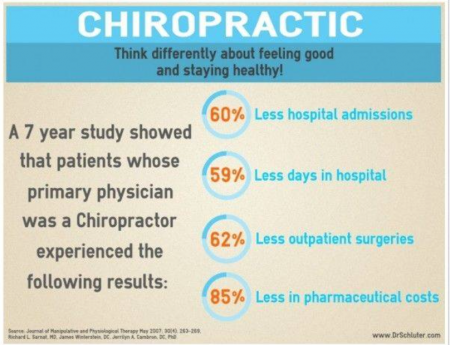 Chiropractic is the third largest primary healthcare profession in the world after medicine and dentistry! Did you know… Your spinal cord has an incredible memory for pain. When you experience an instance of intense pain, such as an acute back pain episode, the neurons in your spinal cord will carry signals more easily to the nerves in your back for several days, making your back feel more sensitive during this time. This is the result of a molecule thought to be the precursor to memory, known as PKMzeta. Your spinal cord is especially sensitive to this molecule and “records” instances of pain as a result. This can make us more susceptible to future episodes of pain when we repeat actions that previously lead to injury, as the spine “remembers” those signals and (much like anything that is practiced over time) gets very good at sending them. As a gentle, safe, non-invasive way of dealing with back pain, look no further than chiropractic care. Did you know… We’re often asked where the name “Acorn Health” comes from. It’s from the old English proverb “Mighty oaks from little acorns grow” meaning great things can come from small beginnings! Our clinic started in 2014 with just Philippa practicing from a single room in Emsworth, and our ‘little acorn’ has grown and flourished into its own premises in the heart of Emsworth with a wonderful multidisciplinary team. This is all thanks to some hard work and the incredible support of our colleagues, friends, family, patients and the local community. The proverb also conveys to us a sense of growth, health and vitality- and our belief that no matter what, everyone can achieve optimal health… Something we are privileged to see our patients achieve under our care. The quicker you’re seen by your chiropractor, the faster you’ll get better. Too often, people suffer in pain for months before seeing a chiropractor as their “last resort”. Research consistently shows that early intervention and care has a profound effect on both how well and how quickly you’ll recover. Our ethos is delivering effective, evidence-based healthcare that is uniquely tailored to you. You deserve the very best healthcare available, and we’re continually reinvesting in ourselves, our knowledge base and our clinic to ensure we provide you with an exceptionally high standard of healthcare. At our clinic you’ll be treated as an individual, listened to and respected every step of the way. Did you know… Chiropractors are trained to treat all areas of the body, but specialise in assessing, diagnosing and managing conditions of the spine. Before starting treatment, your chiropractor will do a full assessment, which will involve taking details about your condition, current health and medical history, and perform a full physical examination (to assess the function of your joints, nerves and muscles) to help make a diagnosis. If you’ve seen a chiropractor before but it’s your first time seeing Philippa, you might be surprised at just how different her treatment and treatment programmes can be. Philippa often refers to her metaphorical “treatment toolbox”- the skills and treatment modalities she has to choose from which she tailors to your needs based on what’s wrong and what type of treatment you would prefer. This means each and every patient receives an entirely new and individual treatment programme, based on your requirements.